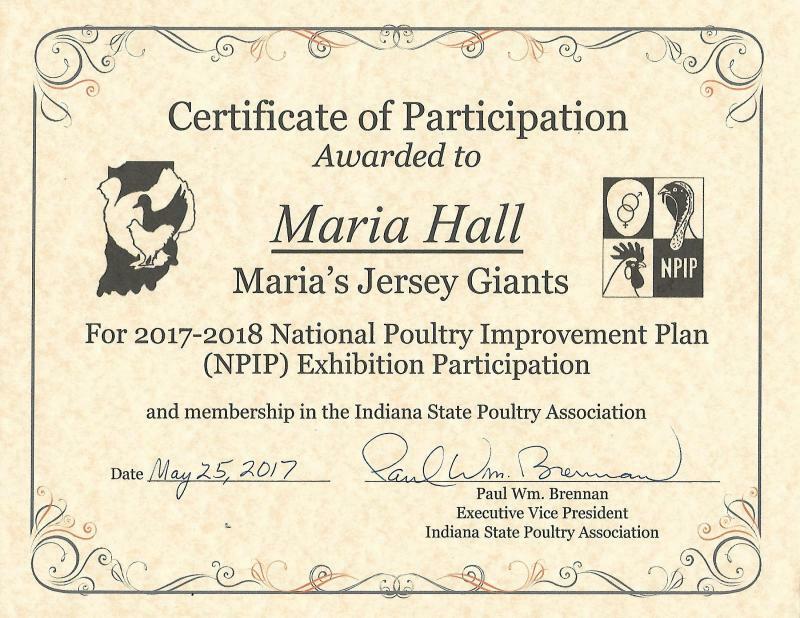 Is Maria's Jersey Giants NPIP? Where do your bloodlines come from? In 1977 I took over my grandmothers flock. Later stray dogs came in an killed many chickens. I received eggs directly from Golda Miller from Bern , KS before her passing away. I also shipped in birds from those that Golda recommended that had her bloodlines. Do you raise Show Quality Jersey Giants? While we strive for show quality birds as with any species that one raises there are birds of lesser quality that we sell as PETS. As with any species it is highly important that you provide proper nutrition with protein levels of 16% to 18 % in order to achieve show potential? How much do the birds weigh at maturity? Jersey giants are slower to mature and do not achieve full size until they are close to 3 years of age. Hens weigh at 8-10 lbs and Roosters 15 lbs. I did not see the rooster at maturity that I once sold but it was reported that the rooster weighed 23 lbs. This is truly amazing! What color and size of eggs do the Jersey Giants lay? Medium to Dark brown color and large size eggs. The largest eggs are not achieved until the bird is mature. We have been told that our medium eggs are as large as store boughten large eggs and are large eggs are more like jumbo eggs in comparison to store purchased eggs. At what age do the pullets start laying? I have heard of our Jersey giants laying as early as 4 1/2 months and typically around 6 months of age. It depends on how much light is provided for the bird and if fed a layer feed. Keep in mind our birds if hatched in the spring have a natural growing process since there is no light for them until spring. Having time to mature is not a bad thing. How long do Jersey Giants lay? Jersey giants lay eggs even at 5 years of age. As they get older however you can expect production to decrease. Also Jersey Giants as with any other fowl have a rest period and will quit laying and will loose feathers (molt) . Don't worry ,.,these feathers will come back in before winter comes. Are Jersey Giants good layers? Do the Jersey Giants have good dispositions? Yes they are truly "gentle giants". On a rare occurence as with any types of chickens or species one can get an animal to be overly brave or fisty. How long do Jersey Giant live? We have had some Jersey's live six years of age possibly longer. Roosters show their age a lot more than hens because their spurs will become long and if not trimmed down it can prevent them from walking properly. It is important to keep back pullets and cockerals on a yearly basis to have replacements. Do you ship baby chicks, birds and/or hatching eggs? Yes we succesfully ship both chicks, started, adults, and hatching eggs. We ONLY ship within the USA. Just this year we have shipped over 200 baby chicks and all have arrived ALIVE. What do you feed your Jersey Giants? We feed 18% Protein Chick starter for first 2 months. We feed 16% layer feed which contains corn, oyster shells, layer supplement when the birds are of laying age. We do not know the actual formula that is ued on the 16% layer. It is highly important for a person not to just feed scratch grains and/or cracked corn as a sole food as the protein level is only 8 to 10% and does not meet the nutrional needs of a Jersey Giant. When a bird free ranges this does provide additional possibilities for increased protein levels by eating grasshoppers and such. How can you ship baby chicks, started birds, and adult through the mail? I ship birds out Monday through Wednesdays to allow for delivery before the weekend. Baby chicks live not only off the yolk within their bodies, but I also provide boiled egg yolks and cucumber slices and/or cantaloupe with the shipment. Believe me they are having a feast while on their trip and show no signs of sress while keeping warm with their buddies. Typically we sell 15 to 20 birds in an order to provide needed warmth during the shipping process. With all adults and started birds we provided them with drained can corn , zucchini slice in half, tomatoes, and/or cantaloupe. How long does it take for my birds to arrive? It takes 2-3 days on Priority mail on Chicks. (only chicks can go Priority) It takes almost always 2 days for poultry that is shipped through the USPS going Express mail. If you want your chicks and/or eggs to be shipped PRIORITY EXPRESS the customer will pay extra . Do you take pre-paid orders for chicks/birds/hatching eggs? Yes we take prepaid chick and hatching egg orders. We start booking for baby chick, started bird, and/or hatching egg orders starting in January through November. Check on availability of birds now as we are in the process of filling orders and there are sometimes extras. Can one join a club for Jersey Giants? How do I go about ordering birds from you? First please take out time to fill our Questionaire form and then you can visit our ﻿Buy Now Link ﻿to purchase. It is always good to do the questionaire before to make sure the birds are available before purchasing. What color of Jersey Giants are there? Jersey Giant come in Blue, black, Splash, White . We do not raise whites. When Golda Miller was living we had a conversation over the phone about "Silvers" and she stated that there just about needs another color recognized such as "Silvers". We do get silvers once in awhile and they are beautiful. On an occassion Jersey Giants will have bronzy color feathers that appear or mismarks. Some are caused by genetics, sunburn, & a judge once even said that it can be caused by feeding corn. I had not heard of this before. Any birds that have any bronzy color we do not recommend using them period for breeding. Do Jersey Giants become broody and do they make good mothers? Yes based on our experience probably 8 out of 40 will become broody. They do make good mothers. Be sure to keep your eggs collected twice a day when you have broody gals. What breedings will produce approximate percents of black, blue, or splash colors?